Assemblymember Wesley Chesbro grinnin' like a fool at Track Seven Brewing Co. in Sacramento while Gov. 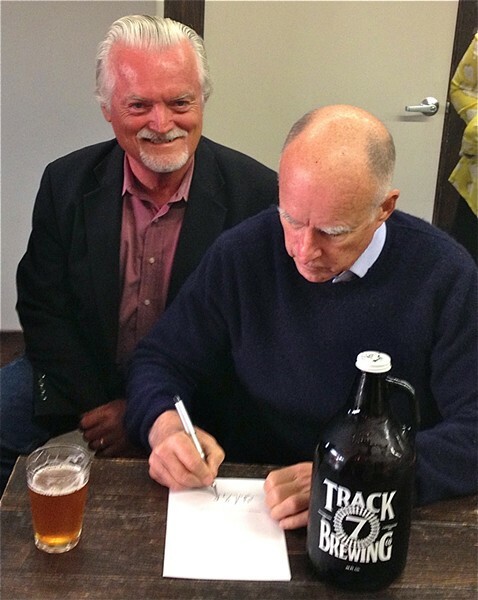 Jerry Brown signs his growler bill, AB 647. Any growler will do, at any brewery — Lost Coast, Six Rivers, Redwood Curtain, you name it — come Jan. 1. That's when Assemblymember Wes Chesbro's growler bill goes into effect. A growler (shh, Kiwi!) is a glass beer vessel about 4-pints-hearty, in which beer connoisseurs and picky drunks enjoy refills of fresh-crafted local brews straight from a brewery. Current state law says a growler can only be used in the brewery where it was purchased. Ches' new law, AB 647 — signed today by Gov. Jerry Brown, says a news release — scraps that old piece of prudery and allows a brewery to refill any growler as long as it slaps a new label on the bottle with its name, and the beer's name, on it. The new label has to cover any old labels on the bottle. It also promotes fun and coolness at those backyard BBQs. We wrote about this pressing issue previously, here.